Since its inception in 2003, Sakura Buffet has been a familiar name to most Singaporeans. Now, their newly-revamped menu boasts over 170 delights from Hong Kong, Italy, Japan, Thailand, the US and France. I had the privilege of attending their new menu launch — unfortunately I could not write about it earlier as I was struck down twice with illnesses that took a few weeks of recovery. Definitely could use all your well-wishes. So how is the revised buffet concept different than before? The restaurant is located at Yio Chu Kang Sports Complex, in a saucer-shaped building. Entering it does NOT grant you the ability to travel around the world in 80 days, but you get to sample food from across the globe in 80 minutes! We started off with salmon yusheng (S$38.80++ for 6-8 pax) before proceeding to the dining banquet. It's a banquet because the whopping restaurant has a seating capacity of 200! One of the key highlights is the Bird's Nest Portuguese Egg Tart. 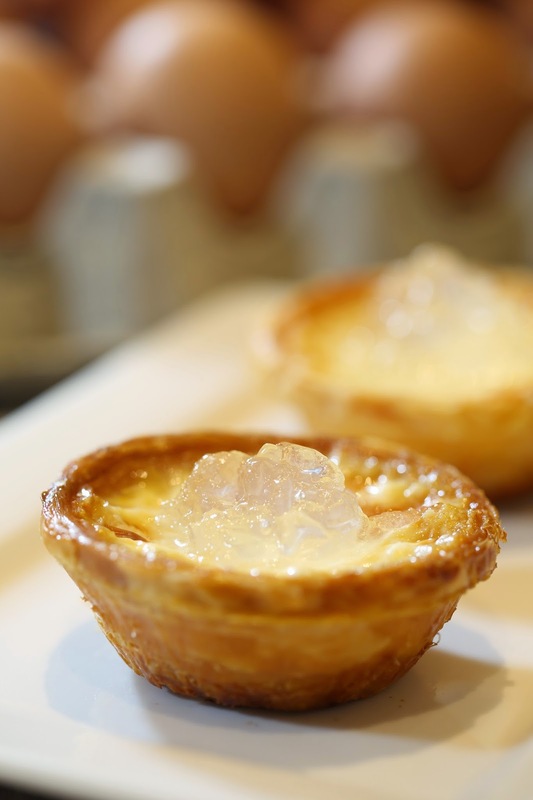 They've elevated the flavour profile of the typical egg tart with refreshing jelly-like bird's nest. It had a flaky, light and buttery crust with rich, creamy egg custard. Although this was a refreshing twist to the typical egg tart, one minor flaw was that the amount of bird's nest on each tart was pretty inconsistent. The one I grabbed was unfortunately pretty flat. Nevertheless, I was pretty satisfied with the comfortingly sweet and savoury morsel! Enjoying my Egg Tart with Bird's Nest! Pastries such as durian puffs and liu sha bao (molten salted egg custard buns) are available as well. Cocooned within the fluffy buns is a sweet-salty molten custard. Dig in and uncover the luscious goodness for yourself! There's so much food — it's a such a challenge to describe the flavours of them all. Seafood lovers will marvel at the sheer variety offered here. Note: the naturally-sweet boiled prawns, steamed green mussels and whelk à la bourguignonne are only available for dinner. The US counter plies diners with American classics such as fries, meatballs in tomato sauce and baked cheese macaroni. You don't have to be a kid to enjoy these all-time childhood favourites! At the Italian counter, you get to mix and match your pastas and enjoy them just the way you fancy! Local delights are also available at a special Singapore counter. Tuck into unique local fusion dishes such as the Boston Lobster & Argentina Prawn Hokkien Mee, an eye-catching twist on a perennial local favourite. The savoury-sweet and succulent lobster will have you returning repeatedly for more! The presentation of the dish is excellent too — generous chunks of brilliantly flamed lobster sprawled on a bed of al dente noodles. This counter also features the Hiroshima Oyster Omelette, the star ingredients of which are fresh and pillowy Japanese oysters. The oysters’ pungent aroma contrasts beautifully with the mild fragrance of the omelette. Round off your voyage with popular desserts such as lava cake, served with a scoop of divine Häagen-Dazs ice cream. Be it large corporate gatherings, an intimate family get-together or a chill-out session with your mates, Sakura is more than capable of rising to the occasion. Pop by for an unrivalled range of global and local favourites, at simply unbeatable prices! Omg! These looks delicious! I'm sitting in my school dining hall, and I'm feeling starving just by looking at these pictures! The sakura-international-buffet is looking so nice and how to testing in your foods?